07-03-2016 : SSLC / 10th Public Exam March 2016 - Private Candidates / Tatkal Applicants can download your hall ticket from 07-03-2016 at TNDGE Official website http://www.tndge.in/ . 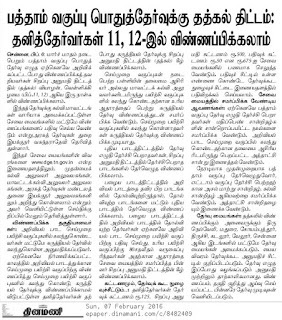 07-02-2016 : SSLC / 10th March 2016 Exam Tatkal Scheme Application Announced by TNDGE. Candidates can apply on 11th and 12th February 2016 (Thursday and Friday) . So apply before the last date soon. All the best ! 10th Tatkal application will be done at the Government Examination Centres near by you. SSLC March 2016 Tatkal Candiates will be allowed to write examinations at Trinelveli, Madurai, Coimbatore, Trichy. Cadalore, Velore and Chennai Exam centres only. 05-02-2016 : Tamilnadu 10th / SSCL Publice Exam March 2016 Hall Ticket for Private / Arrear / Supplementary Exam Candidates will be available for downloading from 8th February 2016 from the TNDGE website www.tndge.in . Candidates can download the hall ticket using their application number and date of birth. 09-01-2016 : SSLC March 2016 Practical Exam Dates Announced. The School Education Department has instructed the schools to conduct the 10th Std Practical Exams from 22-01-2016 to 03-02-2016. 05-01-2016 : Tamilnadu SSLC / 10th Public Exam March 2016 Time Table Released. The School Education Principal Secretary has released the time table. The exam will be conducted from 15th March 2016 to 13th April 2016. 22-12-2015 : SSLC March 2016 Private Candidates - Online Application dates extended to 29-12-2015. SSLC March 2016 Exam Application for Private Candidates Announced. The eligible private candidates can apply from the Government Exam Service centres from 11-12-2015 to 24-12-2015. For all 10th private exam candidates Tamil should be Part 1 Language. Candiates should have completed 14 1/2 years as on 01-04-2016. Should have passed in 8th Standard. If you have failed in the old syllabus. You should write the failed subject in the current Syllabus. If you have failed in Science Subjects, you should have completed Practical Examination. 30-11-2015 : Practical Exam will be conducted for SSLC / 10th Public Exam March 2015 . - School Education Director Mr.Kannappan informed. SSLC Public Exam March 2015 Hall Ticket Download from www.tndge.in website. 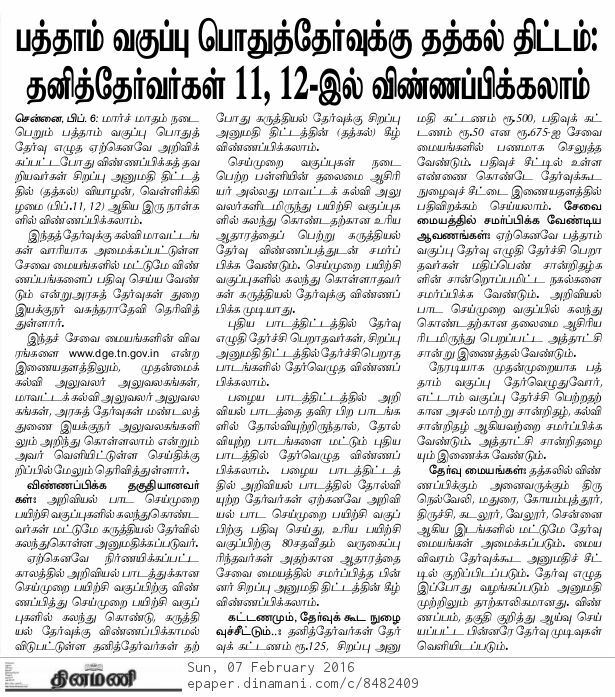 The Tamilnadu Directorate of School Education has published the Examination Time Table for the SSLC Public Exam March -April 2015 . The public exam begins on 19-03-2015 and ends on 10-04-2015 . The examinations will be conducted from 9.15 AM to 12.00.